D.K. Routh and S.R. 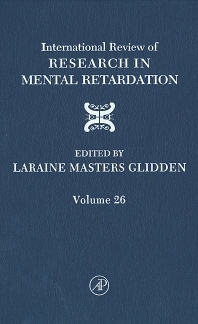 Schroeder, A History of Psychological Theory and Research in Mental Retardation since World War II. B. Tonge and S. Einfield, Psychopathology and Intellectual Disability: The Australian Child to Adult Longitudinal Study. J.L. Wallander, H.M. Koot, and M.C. Dekker, Psychopathology in Children and Adolescents with Intellectual Disability: Measurement, Prevalence, Course, and Risk. G. Grant, P. Ramcharan, and P. Goward, Resilience, Family Care, and People with Intellectual Disabilities. M.G. Valdovinos and S.R. Schroeder, Prevalence and Correlates of Psychotropic Medication Use Among Adults with Developmental Disabilities: 1970 -2000. M.K. Buell, Integration as Acculturation: Developmental Disability, Deinstitutionalization and Service Delivery Implications. J.P. Das, Cognitive Aging and Down Syndrome: An Interpretation. Index. Contents of Previous Volumes.